Our Recipe Import Tool will help you save all your favorite recipes from around the web, Facebook and Pinterest and is available exclusively for Pro Account members (sign up below for only $19/yr with our 30-day money back guarantee!). 1. Make sure the bookmarks toolbar is visible. In your browser menu, click View > Toolbars. 2. Drag this button: or link (Dish Dish) up to your bookmarks toolbar. 3. You’re done! Click “Dish Dish” on any website or on Facebook. Then …. 1. 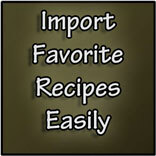 Navigate to the recipe you would like to import (on the web or Facebook, etc.) and highlight the recipe text (all ingredients and directions). 2. 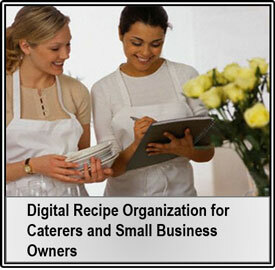 Then click on the Dish Dish button in your toolbar above to open the recipe importer tool. 3. 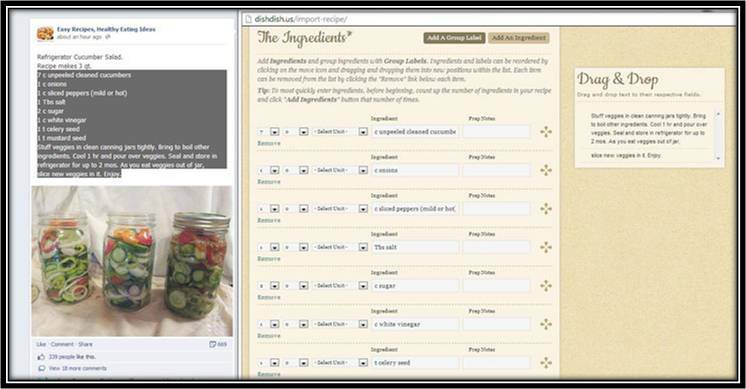 The tool will ask you to log in and then will import the recipe ingredients; recipe directions will be located in the sidebar area, ready to drag and drop into the “Directions” box in the recipe template. 4. Verify all information has been imported correctly (you may need to tweak some of the information) and add other required information – Description, Cuisine, and Category, for example. Also choose a photo for the recipe from the options shown. 5. 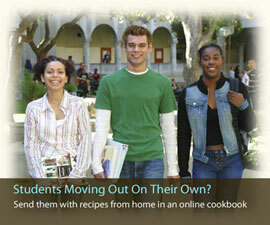 Choose whether to keep the recipe private or allow the public to view and then save! Now the recipe is saved in your online cookbook account, where you can find it whenever you need it and know it will be there! 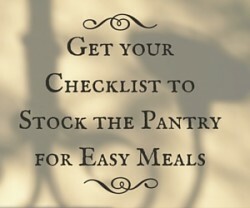 It’s ready to share, edit, add notes and photos, add to your shopping list and more. to grab your toolbar bookmark and get started!